Happy Friday SOTGC readers. It seems like every time I walk into a room, at some point the topic of fitness comes up. Recently I did a lunch meeting with an office and found that they had been doing their version of “The Biggest Loser” and the entire office had been supporting each other in getting healthier and more fit. I always jump right into these conversations and ask people what they do for their fitness routine. Partly because I’m a fitness junkie, and partly because I always like to get new ideas and see what’s working for them. The last couple offices I have been in, at least one or two of the staff has latched onto the spin craze and is pumped to spread the addiction. Almost everyone I know either does or has tried a spin class. I myself have tried this craze that is sweeping through San Diego (possibly the nation but I can only speak for the area I am in). Years ago, one of my friends had gotten into it because of the amount of calories she could burn in one hour, and the awesome house music that this specific instructor always played. I’m always game for a new, fun fitness workout, especially if it involves loud house music in the background. By the end of that hour I was drenched in sweat, had learned the true meaning of gym short chaffing, was super excited about the fact that I had probably just burned about 1,000 calories, was trying to figure out how I could talk my friend into getting a wheelchair to cart me back to the car in, and I was almost positive that I had rubbed off part of my female anatomy on that torture device they called a seat. As I hobbled back to the car cracking jokes with my friend about the fact that I wouldn’t be able to sit right for a week…I could definitely see why people could get addicted to this workout. Though I have not been back to a spin class, I think it’s a GREAT workout for people who get bored on the treadmill, need a low impact cardio workout, or don’t think they can push themselves as hard as a fitness instructor will. Occasionally I have some nostalgia for the class, and have thought about going up to a random person on one of the gym bikes and pumping up the resistance for them while yelling “YOU’RE AT A 4…I NEED YOU AT AN 8!” and hoping they get the joke…however getting hit in the face by a complete stranger doesn’t appeal too much to me, so I have refrained from trying that out. I logged onto WebMD and found an article on indoor cycling classes. In 1986, fitnessfanatic Johnny G (aka Jonathan Goldberg) created one of the most popular indoor cycling programs, called “spinning.” This new breed of cycling instructors turns on the heat, pumps up the music, and urges riders to crank up the resistance as they ride their stationary bikes. Indoor cycling now also uses bars, resistance bands, or barbells to help tone the upper body. Some studios also couple the workout with yogaor Pilates. 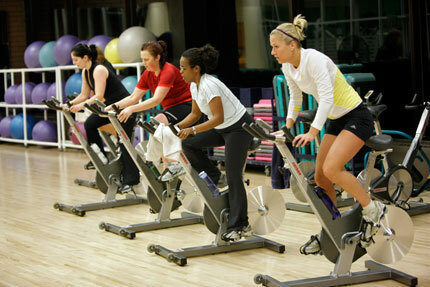 Indoor cycling programs are an efficient workout, which appeals in a high-pressured, multitasking world. “The whole concept was that you could get a full body workout on a bike in 45 minutes and burn between 500 and 800 calories,” says Julie Rice, a co-owner of SoulCycle studios in Manhattan, Scarsdale, and Bridgehampton, N.Y. There are other benefits as well, says indoor cycling instructor and WebMD Senior Medical Editor Brunilda Nazario, MD. “Primarily the physical benefits are cardiovascular: weightreduction, a drop in blood pressure, improvements in diabetes control, and improvements in strength,” she says. You probably have heard of runner’s high — that rush of feel-good chemicals, called endorphins, that occurs after a run. Participants in indoor cycling can get it, too.”The rush of endorphins leads to mental benefits such as improved sleep, increased relaxation, and reduced stress,” Nazario says. Indoor cyclist often leave a class looking as if they just swam laps — they are that drenched in sweat. I almost walked out of the lobby minutes before my first class began when I saw the earlier class exit the studio. They looked like they were melting!“In some people, the excess sweating that occurs with this intense exercise creates a feeling of accomplishment,” Nazario says. “It’s the perfect storm — endorphins, high energy cardio workout with an emotional arc,” says Rice, referring to changes in emotion that riders may experience, often spurred by the soundtrack and instructor. When is too much of a good thing just too much?“Like any exercise regimen, [indoor cycling] should form part of a routine that incorporates cardiovascular fitness, muscular strength, and endurance and flexibility,” Nazario says. If a cyclist is balancing it with other workouts such as yoga or Pilates that complement the cycling classes, they can do this as much as they want, Zuckerman says. Three or four times a week is ideal, she adds. There is a learning curve, so if you don’t fall in love with it after your first class, don’t give up just yet. As with any form of exercise, listen to your body. Staying hydrated by drinking water throughout the workout is also important. “Injury strains and stress on joints and ligaments are always a potential risk if you ride on an improperly fitted bike,” Nazario says. “Dizziness, shortness of breath, and lightheadedness can also occur in people that are not fit, or those that push too hard and are not controlling their heart rate during the ride.” Nazario says all indoor cycling classes should start with safety tips and bike fit. Tell your instructor about any conditions they need to know about, such as back pain, knee problems, or neck problems.